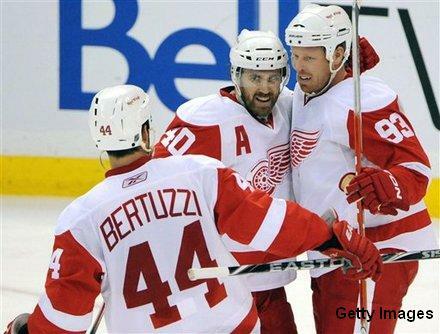 Johan Franzen led all players in goals this week, and he scored all 5 of them in one game against Ottawa. While the Mule didn't do much the rest of the week, he still led an impressive offensive showing by many forwards this week. Honourable mention to Mikael Samuelsson who led all forwards in points (2G, 4A), and Steven Stamkos, who reached 40 goals with a solid 5 point week (2G, 3A). Jack Johnson was the highest ranked defenceman for the past week with his 4 points, 3 of which came on the powerplay. Johnson continues to have a stellar season and has improved his defensive game enough to earn a respectable +/- in the past few weeks. Speaking of +/-, Chris Campoli (if anyone has him in their league) was a +4 on his way to 5 points (1G, 4A) and Shea Weber 3 points (1G, 2A), all of which came via powerplay. Roberto Luongo is currently riding a 4 game win streak and came back after the All Star break ready to prove his critics. He shut out the Coyotes and then helped the Canucks defeat the Blackhawks by posting 42 saves. Luongo had a rough spell there in January, but appears to have righted his ship. Honourable mention goes to Martin Brodeur who posted 3 wins this week, and who now has won 8 of his last 10. While Brodeur is on the shelf for a game or two with a bruised leg now, he's proved his critics wrong and shown he is still one of the best. In the West I'm going to go with Henrik Zetterberg who is having a great year so far. The Red Wings have 4 games this week against NYR, NSH, BOS and BOS. If you feel like taking a chance go with Joe Thornton, who also has 4 games this week. In the East, we're going with Eric Staal who has 4 games this week against NJ, PHI, TB and ATL. Keith Yandle is on fire and I am going to stay with him for my defence pick in the West. The Yotes have 3 games against COL, DAL and CHI and I'm hoping for some powerplay production from Yandle. In the East, going to go with Kris Letang who has 4 games this week against CBJ, LA, NYI and NYR. Have a feeling he will step up his game more than ever with Sid and Geno out for extended periods of time. In the West going to go with Jimmy Howard, the Red Wings have 4 games this week and the games are spread out so there is a good chance Howard plays all 4. In the East going to go with Cam Ward of the Hurricanes, with 4 games this week he will play at least 3 of those games. Both goalies have been hot lately and hopefully they can keep it up this week. TEDDY PURCELL! !last 5 games 4goals 5 assists. Past week 3 goals 1 assist!